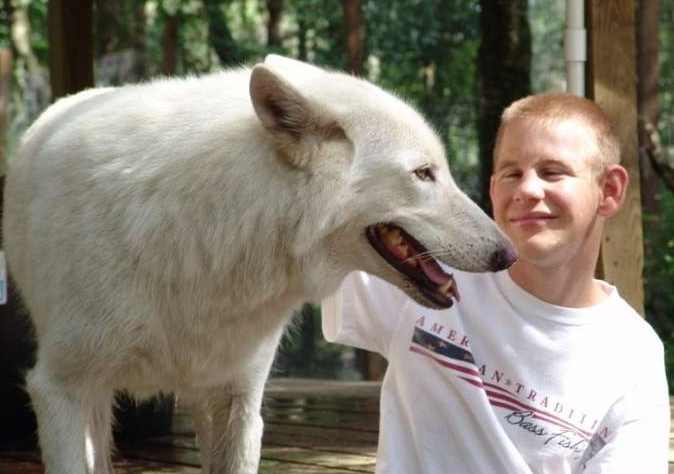 "Purity of heart:" wolves at Clay sanctuary bond with developmentally delayed youth. The large white wolf named Spirit stood peacefully as the young man stroked her chest. She slowly swayed her body and whenever he stopped petting her, the wolf gingerly pawed his leg, encouraging him to continue. Kyle Ferris sat on one of the wooden platforms designed specifically for Spirit and the other 31 wolves and 15 wolf hybrids at Big Oak Wolf Sanctuary near Green Cove Springs. He's been visiting for nearly three years, so he felt comfortable. "The wolves make me feel happy," Kyle said. As Spirit, an Alaskan interior/arctic wolf, stood above him, he smiled and occasionally commented on how soft her fur was or whispered, "Good girl." "See how she's different with him than with other people?" asked John Knight, who, along with wife, Debra Knight, oversees Big Oak. "There's a gentleness there that you don't see as much when she's with others. "Knight credits the difference to the fact that Ferris is developmentally delayed. He has Lowe syndrome, a genetic condition that causes physical and mental handicaps as well as medical problems. While chronologically 23, Ferris functions more on the level of a teenager, said his mother, Susan. "There's a purity of heart there that we've learned the wolves respond to," said John Knight. "Kyle doesn't carry the same level of pressures or concerns as the rest of us. ... There's no anxiety for the wolves to misinterpret and therefore they don't fear him. They accept and trust him as he is and this brings out their gentler side, which is great for them, too." Responses to "Heart-warming Moment Arctic Wolf Befriends Disabled Boy (Video)"
Spirit is a beautiful wolf.